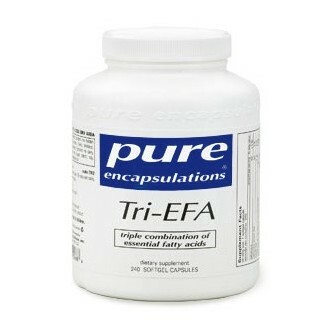 *The omega-3 fatty acids alpha-linolenic acid (ALA) and EPA/DHA, derived from flax seed oil and cold water fish oil, respectively, are combined with omega-6 gamma- linolenic acid (GLA), derived from borage seed oil, to provide enhanced essential fatty acid support. 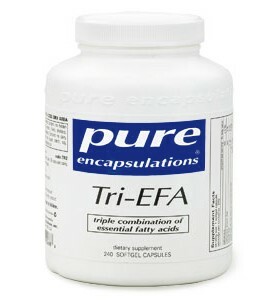 EPA/DHA from fish oil has been shown to support cardiovascular, joint, emotional and skin health. ALA from flax seed oil may be specifically supportive of healthy lipid metabolism and vascular function. GLA is an important precursor of prostaglandin E1, a compound that supports blood flow and vascular health. GLA also promotes healthy immune mediator activity in tissues and maintains healthy arachidonic acid metabolism, actions that provide potential support for joint comfort and skin health.